I saw a LinkedIn discussion not too long ago where change agents were debating whether or not the 70% failure statistic was still accurate. Not surprisingly, the majority of the change agents think that change management failure is shrinking. Recently I came across a chart similar to the one above in the Organizational Change Toolkit text. I modified it for conversational purposes. It frames the 70% statistic in a different light. When Kotter originally threw the 70% statistic out there, I think he meant 70% did not achieve any net gain or benefit. By this chart, Scenarios 1 and 2 are change success. If the organization experiences some sort of numbers gain ... an initiative can be viewed as a short-term success. By individual benefit, I mean change recipient benefit. 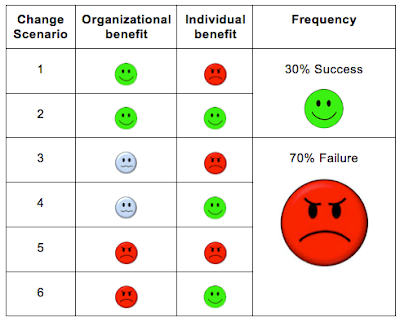 Are change recipients better off after the change? Unfortunately, change scenario #1 is what Wall Street craves. If an organization is going through layoffs, we think this is not good for the human side of the organization. For the financial side, however, layoffs mean fewer expenses & more profit (in theory). That speculation is enough for a stock price bump. For change recipients (employees and frontline management) this means the same amount of work with less people. It is more stress in the short run. Ask anybody how many people used to do the work they are currently doing and the answer is typically "2 or 3" people. If and when the organization improves process or technology to make the workload easier to accomplish, then we would consider that change scenario #2. If I had to guess, I would say that change scenario #1 outpaces change scenario #2 by a 5 to 1 margin. I'm looking at "net" gains/losses. For example, when a hospital switched from paper charting to electronic charting, nurses will tell you that it makes some areas of their work easier, but other areas harder. If the benefits outweigh the annoyances, then we say it is a win-win, scenario #2. What is the ratio of Scenario 1:2 in your organization?